The unmatched accuracy and detail of Humminbird LakeMaster give you a serious edge. Patented features include the ability to select and highlight a specific Depth range, the option to shade shallow water ranging from zero to 30 feet, and the power to synchronize Depth Chart contours and shorelines with the current water levels of lakes, reservoirs and rivers. With these exclusive features and more, you'll have everything you need to make your time on the water more productive. 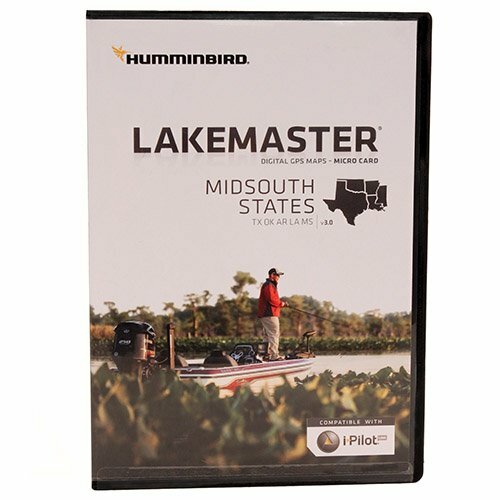 Humminbird LakeMaster mid-south States, version 3 features many freshwater lakes in Texas, Oklahoma, Arkansas, Louisiana and Mississippi, all on one Micro card and SD adapter map card. Version 3 includes detailed coastal shoreline from Texas to Mississippi that allows anglers with i-pilot link to follow the shoreline at a specified offset for hands-free fishing in shallow coastal areas. Great for fishing around mangroves, islands and inter-coastal waterway shorelines. The mid-south States edition map card added over 80 new lakes to the previous version and features over 300 total lakes with contours, of which 212 are now high-definition lakes, including these highly requested bodies of water:- Beaver, AR- Sardis, MS- Sardis, ok- Fort Gibson, ok- McGee creek, ok- Bull shoals, armor- table rock, armor- Toledo bend, TX (partial HD) - Ross Barnett, MS- Pickwick, MS- plus many more!.